The Little Kicks are a four-piece portraying some pretty, indie feeling-sharing. The lyrics, while never really saying much, are not dull or embarrassing. 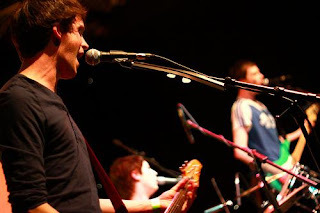 The boys play mid-pace to fast chirpy, chiming tunes, with a faint taste of that folksy indie made famous by bands like Belle and Sebastian and Alfie in there somewhere too, embodying the spirit of skinny indie kids everywhere. The high-hat beats on the drums would make any disco fans smile knowingly. The musicianship in general is streamline and at times tunefully angular and the lads have a charming swagger that is pleasant to watch. The lead singer/guitarist also seems to take great pleasure from playing a few chords on the MicroKORG synthesizer and fiddling with the resonance control. Perhaps not quite as plain as vanilla, these guys are probably more like strawberry ice cream. Sweet, but fans of Rum and Raisin or Rocky Road, they're not going to entice you. They are the sort of band you could bring home to your mum. As rare as it is to find a girl drummer, it must be rarer still to find one that does lead vocals. But Sarah Tanat Jones' positioning is far from the only thing that makes Come On Gang (pictured) interesting. Having just returned from SXSW festival in Texas, and not afraid to chat about it, all three members of the band were comfortable on the mic, engaging the audience with a bit of banter, anecdotes, cheap jokes. Sarah's voice is very folky, which creates an interesting juxtaposition when placed next to the dance-tempo rocky music the lads play. Guitarist Mikey Morrison plays chiming treble riffs and overdriven power chords and bassist Trev Courtney dominates the low end with a full-sounding slightly distorted heavy bassline. Its difficult not to start dancing to this music. The highlight of the set is 'Both Ends Burning', a punky rock-out with an incredibly catchy chorus, which is on the T Break 2008 CD, that you can get free from HMV on Princes Street.